A Prophetstown Firefighters uses a flashlight to check a gas main while the orange light from a building burns surrounds him. 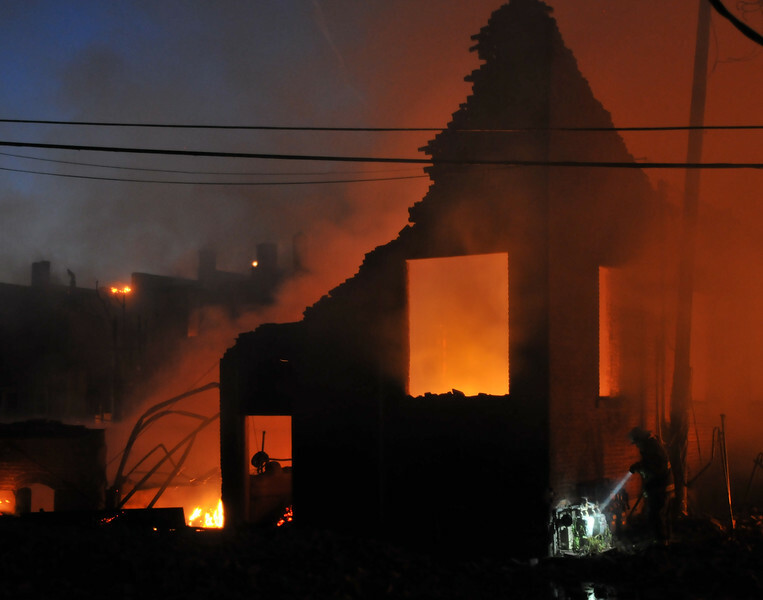 Shortly after 2 a.m. firefighters were called to a blaze in Prophetstown's downtown district, Monday, July 15, 2013. The early morning fire has destroyed eight buildings. Although the fire swept through about 20 apartments above the businesses, residents and firefighters were able to evacuate everyone and no one is believed to have been injured. More than 30 fire departments, some from as far away as Paw Paw, Sublette, and Savanna, and Comance in Iowa,responded to calls for help. Fighting the fire drained the town's water tower, nearby Lyndon's water tower, and had firefighters and private residents trucking water to the scene from the nearby Rock River. Neighbors reported hearing popping sounds around 2 a.m. and awoke to the downtown ablaze. Prophetstown Mayor Steve Swanson said the damage is terrible. He said the city's historical society was heavily damaged in the fire.